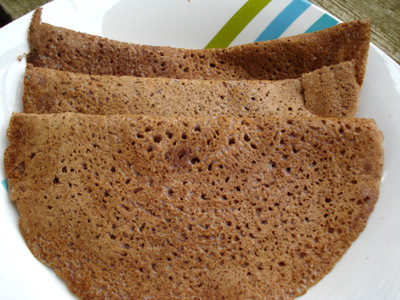 Prathu's Food: Raagi Dosa - Passionate Cooking for Vegeterian Food. Add half content of chopped onion, ginger, green chilli, coriander to the batter. Heat non stick pan spread oil Pour a ladle full of dosa batter from the outward base of the pan in a circular motion in a low flame. Add remaining chopped onion, ginger, greenchilies, coriander press with laddle gently, pour the oil along the edges of dosa. Increase the flame to medium and cook for 3 minutes and flip the dosa, cook for 3 minutes. Great job Pratu..long back I tried a blog like this but couldnt keep on with it with busy schedules...appreciate the way you are posting recipes. Try putting masalas and podis in a different section. You can refer these powders with link there.